Luraina Undershute-Oddy was drawn to the magic of horses from a very young age. Her room was filled with horse figurines and stuffies, she often snuck out to visit neighborhood horses, and she pleaded and begged her parents for a pony. There was a very powerful connection between Luraina and animals. She’d often tell people she had the gift to speak to them and would spend many hours channeling her inner meow. At the age of seven her family moved to the city. Daily horse visits became a thing of the past for many years until her family rescued an abandoned colt. Luraina’s connection with Tango led to receiving her first healing from a horse. He helped mend her torn heart when her parents separated and together they learned about trust and partnership. The family break-up meant moving and saying goodbye to Tango. That transition was a dark time for Luraina and it wasn’t until her introduction to Martial Arts that she felt light come back into her life. She began to shine and went on to compete on the world stage. Luraina loved the discipline and competition, but the glamour of travel, photo shoots and sponsorships came with a price that was too high. It was time for a change. Luraina went to stay with her mother in the small mountain town of Radium Hot Springs. The simplicity of rural living and the beauty of the mountains brought healing to her soul. She decided to stay and began teaching boxing and kickboxing, offering personal training and nutrition consultations. She dreamed of running her own martial arts studio and focused her energy on that goal. But fate had another plan. Love came her way and then Luraina’s focus became her family, raising and homeschooling her four children. Then came the horses. The first, a gift from her mother, was a beautiful Arabian. Eager to find him a companion, Luraina’s second horse was purchased from her neighbour weeks later. Her herd of two slowly continued to grow as her children became old enough to ride. Homeschooling lessons and writings became geared to everything horses! Luraina’s teachings and way of working with her herd was always gentle and kind. To her they were equals – wise friends with four legs. In the summer of 2017 she started a small business for her children called Lead Line Pony Rides. Offering riding lessons for smaller children, she saw how the horses helped them with awareness and confidence through loving interactions. The rewarding feeling this gave her confirmed that she was finally on the right track. Healing hearts through the love of horses was the clear message. Luraina found FEEL (Facilitated Equine Experiential Learning)® – a way of partnering with horses for human healing. At Mystic Waters Ranch, she completed the FEEL training certification program. 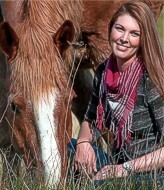 Luraina now operates her own practice, Heart and Soul Medicine Horse, in the Columbia valley. She offers workshops and private sessions with her herd. Luraina is currently training in Reiki and pursuing studies in Emotional Alchemy. She can be reached at heartandsoulmedicinehorse.com or at 250-688-1451. You can also visit her face book page Heart and Soul Medicine Horse.